There are certain movies that are somehow a part of me and feel like they always will be. The Wall. El Norte. The Blues Brothers. And this one. These are different in some way, special. It’s not that I don’t see their flaws — if I step outside myself, I can — it’s that the flaws just don’t matter to me. I love these films because it comforts me to watch them, it’s like settling into an old armchair that you’ve had your whole life. It’s not just nostalgia… watching them doesn’t bring back memories of when I first saw them (though it’s perhaps worth noting that they were all between the ages of 10 and 19). It’s not just familiarity… there are other films I’ve watched more often. I don’t know what it is. They don’t have much in common. Is this a great movie? To me it is. Some might think the writing is overdone, especially in the voiceover. I adore the language in it. There are lines I think about all the time, even little things like Grace Zabriskie’s sarcastic “Oh to be sure, you’ll just go steal some more.” I love the attitude of the film… it’s like a family road trip movie, but with junkies. It’s the most charming drug movie there is, full of comedy but never overplayed. It hits all these funky tones. It isn’t black comedy, it’s… I dunno, grey comedy? Maybe some think it isn’t a realistic depiction of the junkie lifestyle. They don’t wallow in filth. There are no violent outbursts. You don’t see anyone sitting in jail, you don’t see anyone screaming and shivering from withdrawal. There’s no vomiting. No open sores, no collapsed veins, no rotting teeth. These are functional dope fiends. The film doesn’t glamorize drug use, but it doesn’t demonize it either. It’s a way of living. Not the best way, and a lot of people have a much, much worse time with it… but there’s nothing terribly unrealistic about the way Bob and his crew live. 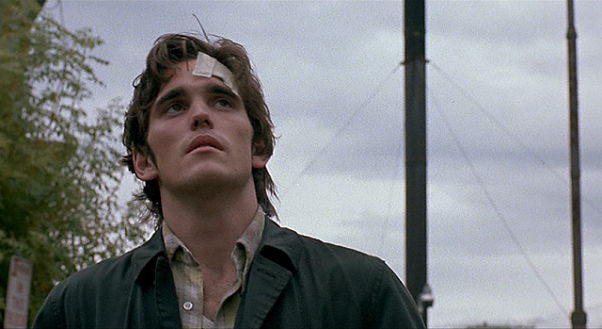 And Matt Dillon is pitch perfect. I haven’t seen much of his work, but of what I’ve seen this is definitely the best. When he’s doped up, he’s not raving and drooling, just jittery. He delivers his lines in a way that suits the comedy perfectly, kind of a world-weariness. It’s not a big, stylized performance but he’s mesmerizing and entertaining. Which is not to discount the work of Kelly Lynch, James Gros or Heather Graham (and who can forget William S. Burroughs? ), all of whom seem perfect as well. But maybe that’s my special, undefinable connection to the film speaking. This entry was posted on March 24, 2013 at 12:35 am	and is filed under Movie Reviews. You can follow any responses to this entry through the RSS 2.0 feed. You can leave a response, or trackback from your own site.